Bushmaster Firearms International has been making world-class rifles ever since 1973, and most famously, their AR-15 variants. The American-based company, currently owned by the Freedom Group, is the leading distributor of AR-15 variants in the U.S. The reason I refer to it as a variant is because, technically, Colt owns the trademark and all other brands simply replicate it. Colt bought the rights to the gun from ArmaLite in the late 1950’s, which is the source of the “AR” (ArmaLite Rifle) distinction. Nevertheless, Bushmaster’s AR-15 models are considered top of the line and are used by militaries and law enforcement agencies around the world. The semi-automatic M4 carbines (available as A2 or A3 models) are arguably their best ARs and are just one of many great weapons in their XM-15 line. A lot has changed for the AR-15; it is significantly heavier, more widespread, and has gained notoriety for its use in crimes across the globe. The original model was designed solely for police and military use but has since been adapted for civilians. The first model is now a major collector’s item because of several favorite discontinued features. Since the 1994 federal assault weapons ban expired in 2004, sales for semi-automatic firearms, especially the AR-15s, have skyrocketed. Hunters, competitive shooters, and police have consistently applauded this weapon, and reasonably so. The AR-15 has been celebrated for decades not just for being extremely accurate and reliable, but also for its customizing capabilities. Because of its minimal recoil and user-friendliness this semi-auto is suitable for novices and experts alike. Rest assured that all of your M4-required reading needs are covered here in our Bushmaster M4 Type Carbine (AR-15) Review. Bushmaster proudly asserts that all of their M4s are built to meet or exceed Mil Spec (U.S. military standards). With the M4’s impressive specs and top-notch American engineering, it’s no wonder why it is one of the most widely circulated AR-15s in the world. Bushmaster is clearly dedicated to producing top-shelf firearms and their constant spec upgrades and innovations attest to that. 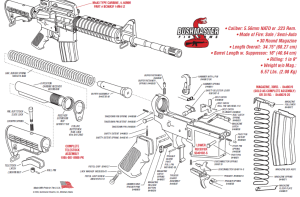 Bushmaster Firearm’s M4 Carbine (XM-15 line) was engineered according to the United States Military Standard and modified for civilian use resulting in a striking and universal rifle. There are countless MSR (modern sporting rifle) parts out there and it’s good to know that every fine detail and accessory for your M4 Carbine can be customized to your liking. The M4 was constructed to be extremely accurate and durable, and the Teflon-coated 7075 T6 anodized receivers and chrome-lined barrel (with 1×7” twist) ensure just that. To ensure speed and efficiency, the M4 is built with the classic M16 bolt carrier for smoother cycling, and M4 feed ramps for better feeding. Remarkably, Bushmaster designed this gun’s rear with outstanding capabilities. First and foremost is their Mil Spec 6-position stock, which easily adjusts to any shooter’s precise preferences. For added durability, they added the Mil Spec receiver extension (buffer tube) and developed a staked castle nut to stabilize it. The M4 comes with forged upper and lower receivers, but if you are a stickler for carry handles, remember the A2’s is fixed and the A3’s is detachable (enabling access to a Picatinny rail). In my experience, one factor that is often overlooked is magazine availability, and our gun here can accept all AR-15/M16 type STANAG/NATO mags. Depending on your preference, two different flash suppressors are available. The standard models feature the fixed flash suppressor and the Patrolman carbines are equipped with the highly popular removable “bird cage” suppressor. Another plus is that all critical steel components of the firearm are coated with a Mil Spec. manganese phosphate to protect against corrosion. 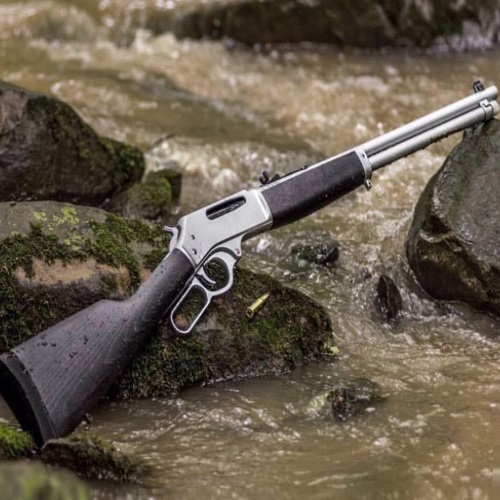 This gun is built to last! Related: Check out our Glock (17, 19, 26, 30), Remington (R51, 700, 770, 870, 1187) and Mossberg (500, 930) Features! As noted previously, this gun was engineered to shoot accurately and effortlessly for years. Nearly every component of the M4 was designed to make it more user-friendly and precise. M4’s are famous for their nominal recoil, and because of its strong grip and 6-position stock, any shooter can find a comfortable arrangement. With the introduction of the free floating hand guards in the 90s, the AR-15 variant’s accuracy skyrocketed. Furthermore, the cycling and feeding of this gun are extremely reliable, which makes shooting it easy and fun. Because Bushmaster has made personalization basically effortless, shooters of all skill-sets, experiences, purposes, and preferences, can perfectly mix and match their weapon. The sights on the M4 are pretty standard, but see below for a more in-depth analysis. It’s my firm belief that the numbers speak for themselves, and Bushmaster’s AR-15’s are among the world top-selling in the world for good reason. The M4 feed ramps and bolt carriers are the harmonious partners for the already impressive magazine system of the Bushmaster AR-15’s. Their feeding system works with the various universal STANAG magazines, which makes several configurations and capacities are available. Although originally prone to malfunction, the STANAGs have been heavily modified with high-grade steel bodies, rust-resistant chrome-silicon springs, and anti-tilt followers, to be highly resilient and reliable. To say that the M4 comes equipped with basic adjustable front and rear iron sights would be a gross underestimation. Many people prefer to remove the carry handle and mount a Picatinny rail to increase their options. Some rear sight carbine systems offer both wind and elevation adjustments, which obviously make shooting in harsher conditions much easier. 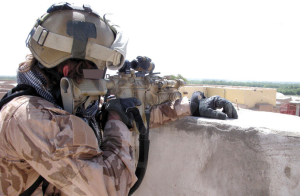 Depending on each shooter’s preference and purpose, a wide variety of scopes, holographic sights, red dots, and night vision equipment are mountable on the upper receiver’s rail. The safety features of Bushmaster’s M4 model AR-15 variants are standard, which makes firing in “combat” situations quick and easy. Although gun safety is pretty universal, Bushmaster has a list of fundamental safety precautions on their website, which I recommend reading. To disassemble your Bushmaster M4 AR-15 first remove the two pins in the lower receiver (you may need a small prodding tool for this) and detach the upper and lower receivers. Next, take your upper receiver and remove the charging handle and bolt carrier. For the next step you will need your multi-tool to remove the firing pin retaining pin and then drop your firing pin out. Be careful not to lose these – they are very small. 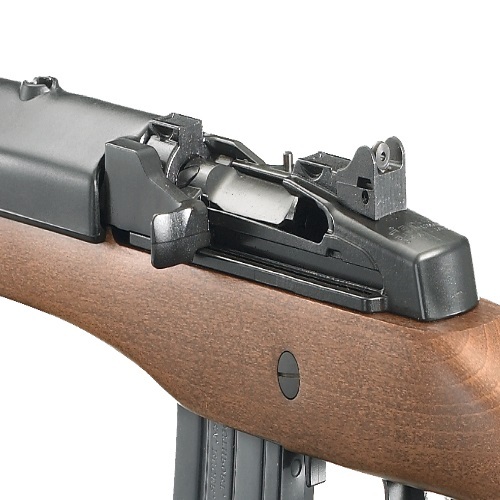 The final piece of the upper receiver is the bolt, and all you have to do is push in and twist the knob and it should come right out. Now onto the lower half; first pull out the buffer tube, buffer, and recoil spring. It is as simple as that. This gun is as easy to put back together as it is to disassemble. It is very important that at each stage of the process to make sure to clean each piece and compartment. Failure to keep your gun clean can negatively affect your gun’s efficiency and life-span. One of the places that people neglect to clean is the area where the firing pin rests. This failure has unfortunately caused too many AR-15s to become less reliable – clean it well! 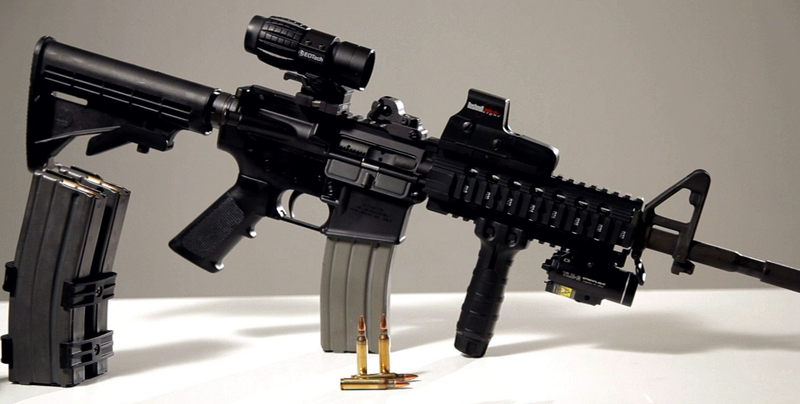 With several options like A2, A3, or Patrolman series, prices for the Bushmaster AR-15 variant can vary between $650 and $1,000. It’s not uncommon to buy one of these rifles used, but make sure you buy from a highly reputable source. The last thing you want to do is find a great deal and then find out at the range why it was so cheap. For such a high-quality firearm that will last for years, the price is a reasonable investment for any serious shooter. The AR-15 variants are loaded with accessory options and Bushmaster has got them all. 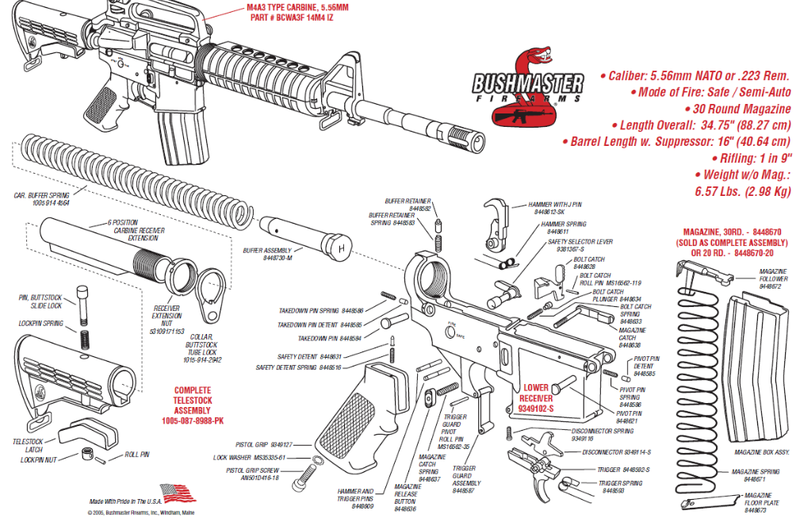 The Bushmaster Firearms catalog offers individually sold upper and lower receivers for many of their models. Most people stick with the pre-equipped lower receiver, but if you fancy a skeleton or trapdoor stock they’ve got you covered. 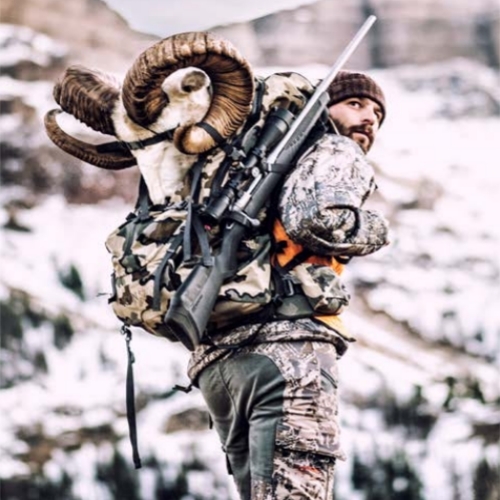 If you love and trust Bushmaster then check out their catalog which offers other accessories like field repair kits, varying round magazines, enhanced pistol grips, foregrips, slings, and cleaning kits. At the end of the day, you can’t go wrong with Bushmaster. So much has changed with AR-15s and with Bushmaster itself, but as time goes on they are only getting better. The XM-15 is a great series of guns and the M4 carbine AR-15 variants are no exception. They’re long-lasting, reliable, accurate, and American-made. It’s no coincidence that they are the largest supplier of AR-15 variants in the country. Bushmaster is clearly dedicated to excellence and has engineered a semi-automatic weapon for all types of users with all types of preferences. It’s not only fun to shoot, it’s easy to manage, dependable, and if taken care of properly, you’ll be shooting it for years. Thanks for checking out our M4 feature! Read about more great rifles like the Remington 597, Ruger Mini-14, FN FAL and SCAR, and Kel-Tec Sub 2000 here at Gunivore! Savage Arms Axis Bolt-Action Rifle Review: Like a Bolt Out of the Blue! Great review. I wish I had read it before I purchased mine…would have made me more intrigued as I handled it at the Gun show. As it stands, I have experience from a tour in Iraq using the full auto feature. Very fun indeed. Thanks again for taking time to share. I purchased my Bushmaster A4 in 2017 It reminds me of my issued weapon. It had many of the features I was looking for especially the chromed lined heavy barrel. I don’t know exactly how many rounds have went through the pipe but I think it’s fair to estimate better than 2000. I do own other AR’s with free float handguards but I’m kinda old school so the hand guards and iron sights are what I was trained on. I have total confidence that if the shtf I could rely on my Bushmaster and am willing to bet my life on it. I take very good of my weapons so they will take care of me if and when it’s necessary.ive never had a ftf or a fte. I thinks it’s a lot of weapon for the price and would definitely recommend it and would buy it again.